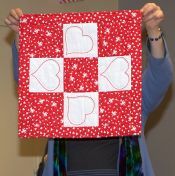 Lee Ebs was Quilter of the Monthfor January 2005. Lee was born in Ohio and grew up in Kentucky. At an early age she began to learn how to sew on her great-grandmother's treadle sewing machine. As she grew older the machine became hers. Her college years were spent in North Carolina and so was her sewing machine. The day after Lee's last college test she packed her things and headed for New York City. During the day she worked for Pan Am. In the evening and during the weekend she would try to spend some time sewing. 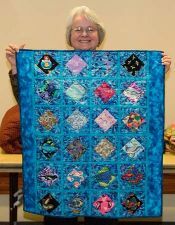 Lee was soon able to purchase a new sewing machine and she became interested in quilting. 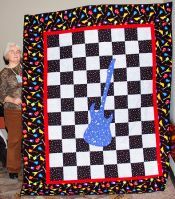 Lee watched quilting on televisioin, bought quilting books and quilting magazines. 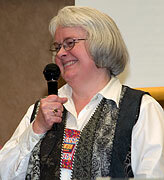 Then came Empire Quilters and soon Lee served as Newsletter Editor, taught a Focus Group on redwork embroidery, made many charity quilts, and hosted many Empire Quilters' speakers. 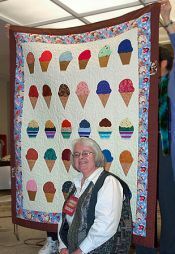 She is currently teaching quilting for the blind at "Viscones" and is our guild Secretary. What's Wrong in the Web?